Igor’s expertise focuses in the field of Digital Signal Processing (DSP) for Communications. His research and work over the past 4+ years covered topics such as signal processing for G.fast Digital Subscriber Lines, highly-parallelized DSP schemes for optical communications and clock synchronization. Such R&D efforts were conducted over several projects funded by external university partners, in which he leaded the full process of physical layer innovation, from theoretical conception, to simulation, up to prototyping using microprocessors and FPGAs. His current research focuses on the algorithms and hardware architectures to support synchronization between remote radio units (RRUs) and baseband units (BBUs) that communicate over Ethernet fronthaul networks. The goal is demonstrate the capabilities of an Ethernet-based fronthaul to achieve the accuracy required by multi-cell and multi-user MIMO transmission schemes. 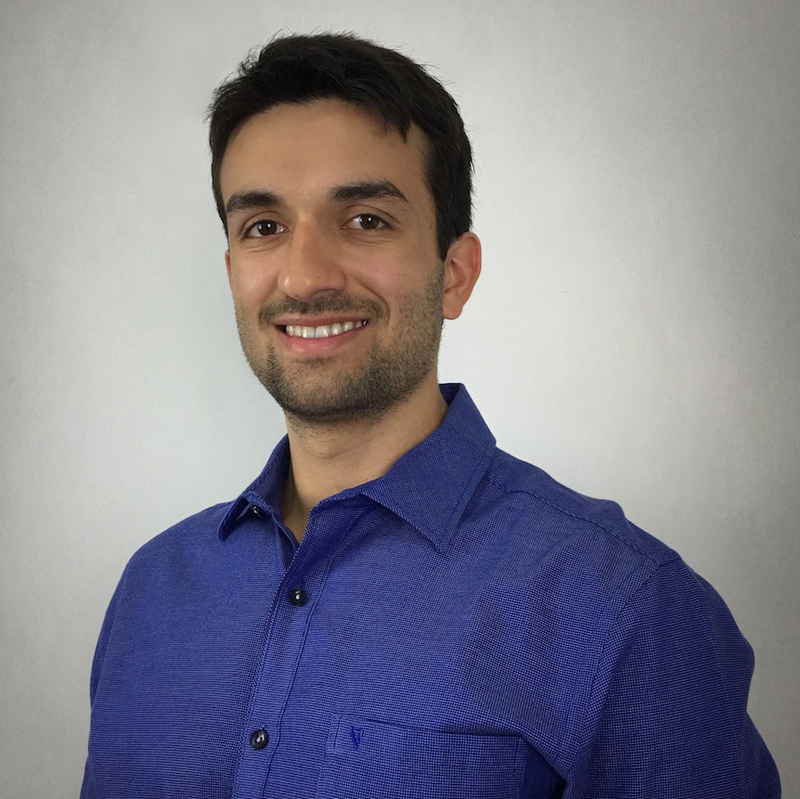 He is investigating techniques that span a variety of topics, from time-sensitive network packet transmission schemes, to estimation theory, digital communications and control systems, all of which are materialized through his VHDL/C developments in an FPGA-based testbed. He is aspired to bring the next-generation of cost-efficient fronthaul solutions that will reduce the costs of denser indoor 5G deployments exploiting the widely available Ethernet cabling and equipment infrastructure. Current cloud radio access networks (C-RAN) operate over synchronous fronthaul networks with dedicated transport channels and synchronization distribution over the physical layer. In an opposite trend, the goal of enhancing the statistical multiplexing gains of C-RAN and lowering fronthaul costs led the industry to develop an increasing interest in Ethernet (packet-based) networks as an alternative for fronthaul deployments. However, since Ethernet lacks a native ability of PHY-based synchronization distribution, it requires additional solutions, such as the IEEE 1588 Precision Time Protocol (PTP). The latter is an attractive solution due to flexibility and costs, being especially interesting for indoor deployments, where synchronization through Global Positioning System (GPS) can become challenging and costly. The open question, however, is whether PTP achieves the accuracy required for radio transmissions. Specifically when multiple separated radio-frequency (RF) chains are served by a centralized baseband processor and used for coordinated transmissions, stringent time alignment requirements are posed. The goal of the project, therefore, is to contribute towards answering this question, propose theoretical innovations and provide proof-of-concept demonstrations. During the past year, Igor led the development of an Ethernet fronthaul testbed with embedded PTP-based time synchronization. The testbed has been used to evaluate the PTP synchronization performance when sharing the Ethernet network with frames carrying radio (LTE) traffic. 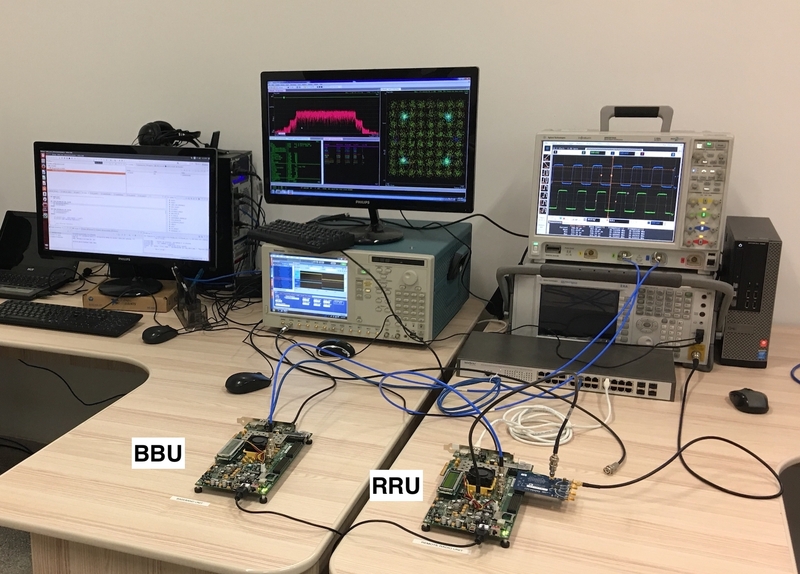 The testbed is shown below, where the FPGAs representing the baseband unit (BBU) and remote radio unit (RRU) are indicated. Highly parallelized implementation of polyphase filtering for pulse shaping in coherent optical transceivers. The research proposed an innovative implementation architecture for a fractional sample rate converter designed for pulse shaping in coherent optical transceivers. The proposed architecture achieves sufficiently high parallelization levels such that even hardwares operating at relatively low clock frequencies (such as FPGAs) are capable of processing baseband samples and passing them to ADCs operating at very high rates that are compatible with optical communications (for example at 400 Giga-samples/seconds). During 2013 and 2014, while the new Digital Subscriber Line technology named G.fast was being standardized by the ITU-T, the Signal Processing Laboratory (LAPS) at the Federal University of Pará developed a G.fast modem prototype. The solution was implemented using a dedicated Digital Signal Processor, an FPGA board and a self-developed analog front-end. This project was coordinated by Ericsson research, and conducted by postgraduate students at LAPS. By that time, Igor was finishing his undergraduate course and starting his masters. He participated in the project by investigating frame synchronization DSP algorithms to be implemented in the prototype. Algorithms for mitigation of insufficient cyclic prefix distortion and alien crosstalk. In the years that preceded 2014, the industry was rushing towards new signal processing algorithms to support the (by that time) new ITU-T DSL standard, called G.fast. The fact that this new standard enhanced the transmission bandwidth up to 200 MHz was challenging in various aspects. For 18 months, the Signal Processing Laboratory (LAPS) at the Federal University of Pará carried a project supported by Ericsson Research to investigate miscellaneous G.fast algorithms. Throughout his full-cycle participation in the project, Igor conducted two specific investigations. The first concerned the fact that 200 MHz G,fast channels present much longer impulse responses in the time-domain, that is, longer time dispersions, when compared to predecessors (such as VDSL). This served as a motivation to propose a novel algorithm for keeping DMT cyclic prefixes short and mitigating the remaining interference with low computational cost. His second investigation was motivated by the fact that G.fast transmission lines in practice can coexist with uncoordinated lines, which are sources of strong crosstalk. The so-called alien (out-of-domain) crosstalk introduced by such lines causes serious degradation in the system’s capacity, so its mitigation is virtually essential. In collaboration with a colleague PhD student, Igor investigated an alien crosstalk mitigation method based on noise prediction and worked to provide guidelines about the feasibility of the crosstalk mitigation technique.